The world-renowned wine growing region of Napa Valley has a history rooted in Spanish, Mexican and Native American culture. Vineyards were planted almost as soon as the area was settled, and today this tradition continues through many of America's finest wineries. Tourism also plays a major role in Napa's economy as visitors flock here to enjoy the fine climate, the trendy little towns and, of course, the wine. Although six different Native American tribes shared this part of northern California for centuries, it was the Spanish and the Mexicans who established the Napa Valley's modern history. Russian pioneers, based in the still standing and nicely-preserved Fort Ross, had been grazing livestock around Sonoma County since the early 1800s. In 1823, a Spanish mission was founded at Sonoma by Padre Jose Altimura, although the Mexicans controlled the valley from 1836 until the Bear Flag Revolt in 1846 following the Mexican-American War. A year later, Mexico ceded the territory to the United States. 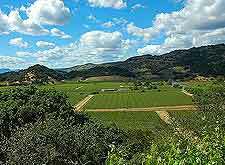 Once America gained control of California, the history of the Napa Valley quickly turned towards its Anglo settlers. 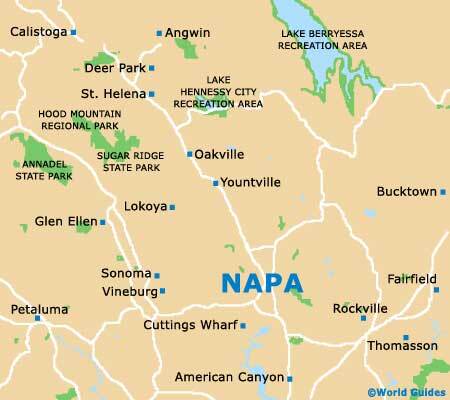 The town of Napa was established in 1847 and a wave of pioneers and prospectors soon flowed into the valley to raise cattle and grow crops. During this period, Napa's Main Street was a booming strip of saloons, hotels and gambling halls, and many of these original buildings still grace its streets. When the great California silver rush rolled through the region in the late 1850s, Napa town really took off. Immigrant laborers from all over the world came to the area seeking work and fortune. Although the quicksilver boom only lasted a few years, many of the newcomers stayed on because of the temperate climate and good growing soil. Convenient transport along the Napa River to San Francisco ensured the potential for trade and commerce with the young town. John Patchett started Napa's first commercial winery in 1859, ushering in a trend in viticulture that remains today. 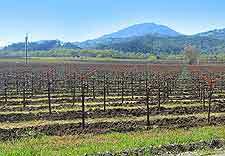 Nearly 400 wineries now operate in the Napa Valley, including well-known labels like Inglenook and Beringer, which have been around since the late 1800s, along with newer boutique wineries like Sequoia Grove and Duckhorn Vineyards. Wine is the main tourism draw for the area, as visitors base themselves in Napa and other nearby historic towns, venturing out each day to explore the beautiful Napa Valley and its wine history. With more than five million annual visitors, the town has a well-developed tourism scene, which caters well to an upscale crowd. Charming towns like Calistoga and St. Helena are home to some of California's most famous restaurants, art galleries and boutique shops. 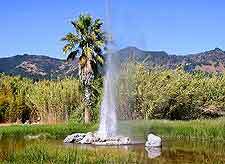 Besides wine tours and tastings, visitors can also enjoy the natural hot springs at Calistoga, ride the Napa Valley Wine Train or take a morning hot-air balloon ride. There are around ten golf courses in the valley, as well as plenty of trails for biking and walking. With its rich local scene thoroughly entrenched, the Napa Valley looks set to continue as one of America's premier vacation destinations for decades to come.